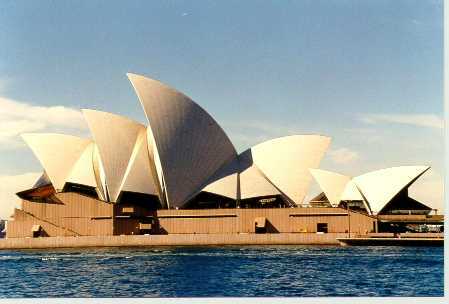 The city of Sydney, one of the most visually spectacular cities in the world, is set on a magnificent natural harbour with two of world's most striking structures on the edge of the city centre. They are the massive iron arch of the Sydney Harbour Bridge and the unique architecture of the Sydney Opera House on a long point into the harbour. 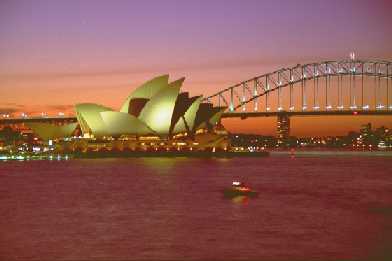 Sydney founded in 1788 is Australia's oldest and largest city (3.5 million people). A large portion of Sydney's residents were born overseas and immigrated giving the city a multicultural mix manifesting itself in a rich diversity of restaurant cuisines. Two hours drive west of Sydney are the sunken valleys in the spectacular Blue Mountains. Sydney city centre can be explored in less than a day by walking. 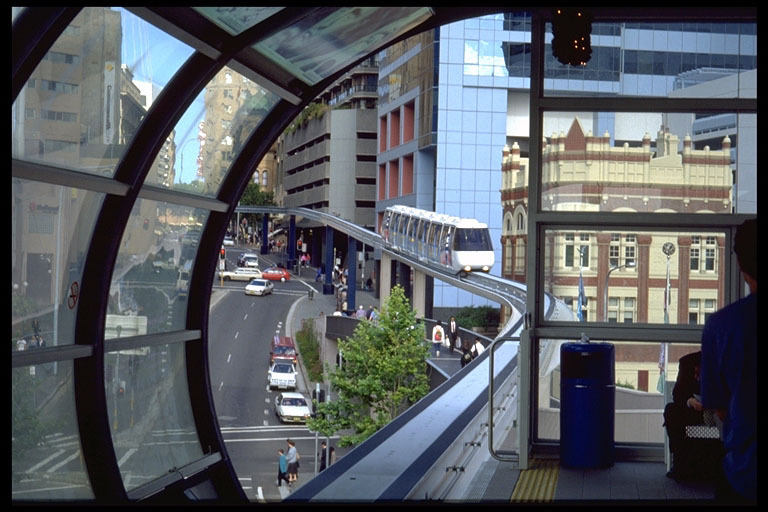 The monorail (pictured) is useful for going to Darling Harbour or as a tourist novelty to get around. Sydney's main street is George Street running south from The Rocks, through the financial district to the main shopping area around the intersection with Market Street. The ornate Bzyantine style Queen Victoria Building shopping arcade occupies an entire block here. Just south is the elaborate Town Hall and St Andrew's Cathedral, the oldest in Australia. Macqaurie Street, on the eastern edge of the city centre, is lined with public buildings including the State Library (open daily), Parliament House (open weekdays 9.30am to 4pm, free entry), the Mint, Hyde Park Barracks (museum open daily 10am to 5pm, entry $5, students $3), and St James Church. Nearby is St Mary's Cathedral. On the eastern side of the city centre is the tranquil Hyde Park, grassy Domain and the Royal Botanical Gardens which faces onto Sydney Harbour. China Town is centred on Dixon Street and Goulburn Street. Nearby in Darling Harbour is the excellent Chinese Gardens. A tranquil garden with chinese padodas, ornamental lakes and chinese teahouse. Open daily 9.30am to 5pm. Entry $3, children $1. The old disused docks here were demolished and redeveloped at huge expense. Now the harbour boasts many massive modern leisure attractions. Get to darling harbour from the city centre by the monorail, the tram from Sydney's Central railway station or walk across the historic Pyrmont Bridge which the monorail also crosses. Sydney Aquarium on the eastern side before you cross the bridge is first class. View sharks, seals, ocean and freshwater fish and coral from perspex underwater tunnels. Open daily 9.30am to 10pm. Entry $16, students $10. Australian National Maratime Museum explains Australia's maratime history from the First Fleet of convicts to Aboriginal canoes, surf culture and Australia's Americas Cup win. A racing yacht, navy destroyer and Vietnamese refugee boat are moored there too. Located at the west end of the Pyrmont Bridge. Open daily 10am to 5pm. Entry $7, students $4.50. Powerhouse Museum is a massive museum covering diverse topics of science, technology, history and art presented in superb hands on interactive displays. Corner of 500 Harris St (corner of Pier Street). Open daily 10am to 5pm. Entry $8, children $3, free the first Saturday of each month. Star City Casino is done done in a tacky tropical theme. There are a few restaurants there too. The tram runs to the casino. The casino is just northwest of Darling Harbour. While in Darling Harbour also consider the IMAX cinema with the world's largest screen, Segaworld entertainment centre, the Motor Museum and the tranquil Chinese Gardens (covered under Chinatown above). Another good scenic choice is the ferry to Watson's Bay near the south head of the entrance to the harbour. The route follows along the south side of the harbour past Sydney's most exclusive suburbs. Getting off and walking along the oceanside cliffs of south head at Watsons bay is scenic too. Yet another good ferry ride is west up the Parramatta river to Parramatta (one hour away). Metropolitan ferries also cross the harbour to Taronga Park Zoo which houses Australian and overseas wildlife (see Zoo description). Sydney's famous seedy red light district and backpackers mecca renowned for its wild nightlife. Many backpackers start their Australian adventure here. There is a lot of cheap accommodation available. Tacky and seedy Darlinghurst Road is the main street which changes its name to Macleay Street towards its end. The youth hostels are predominantly on the much more pleasant tree-lined Victoria Street. Catch the train to Kings Cross from the city centre or walk there through Hyde Park and along William Street. It is only 1.5 km east of the city centre. A long strip of cafes selling lattes, clothes shops, bars and nightclubs many of which are gay. The strip stretches southeast from the city centre through the suburbs of Darlinghurst, Surrey Hills and Paddington. Grunge suburb in the inner southwest. King St is the main street. It is lined with cheap cafes, Indian restaurants and alternative clothes shops. Buses from the city include 422,423,426 and 428. All run along King St.
Australian wildlife in a natural bush setting as well as lots from overseas. The zoo is on the north shore in Mosman. Easy access is by ferry from Circular Quay. Open daily 9am to 5pm. Entry $15. Phone 99692777. To the south of Bondi Beach a walking path follows steep cliffs to Tamarama and Bronte beaches. The path is also very popular with joggers. Trendy Tamarama beach, 10 minutes walk from Bondi, is a small cove with rocky headland on either side. Bus 391 runs from the city via Bondi Junction train station to Tamarama. Bronte beach is surrounded by parkland and has good surf. Bus 378 runs from Central Station via Bondi Junction train station. Coogee Beach is a pleasant suburb a little further south. A few hostels and hotels are located at Coogee. The beach here is calmer as it is somewhat protected by reefs. Catch bus 372 from Central Station or bus 373 from Circular Quay. Alternatively catch a train to Bondi Junction and change to bus 314 or 315. A lively place on the north shore near the north head to Sydney Harbour. This suburb set on a narrow peninsula has a great ocean surf beach, a calm bay beach and a main street of icecream shops and cafes linking the two. It attracts many tourists but is still pleasant and not overdeveloped.. Walking to the North Head provides panoramic views of the entrance to Sydney Harbour. Also consider hiring surf equipment or bike (or in-line skates) to ride along the beachside. Ocean World aqaurium houses sharks, stingrays and other large fish which are viewed from underwater perspex tunnels. Entry $14, students $10. Ferries between Sydney and Manly take 30 minutes. The Jet Cat is faster but double the price. They both leave for Manly from the Circular Quay ferry terminal. North of the heads they are: Manly, Curl Curl, Dee Why, North Narabeen, Mona Vale, Newport Reef, North Avalon and Palm Beach. South of the heads they are Bondi, Tamarama, Coogee and Maroubra. South of Botany Bay is Cronulla Beach. Surf equipment is available for hire at Manly (44 Pittwater Rd. Phone, 02 9977 3777) and Bondi (72 Campbell Parade. Phone 02 9365 0870) for around $25 for the day. Eva's Backpackers is clean and friendly. 6-8 Orwell Street. Phone 02 9358 2185. Dorm $20, double $48. Always book ahead. Pink House has a social atmosphere and pleasant patio. 6-8 Barncleuth Square, Kings Cross. Phone 02 9358 1689 or 9326 9775. Travellers Rest is clean with friendly helpful staff. 156 Victoria Street. Phone 02 9358 4606. Rooms have TV and fridge. Potts Point House 154 Victoria Street. Phone 02 9368 0733. Backpackers Connection is quiet and clean. 2 Roslyn Street. Phone 93584844. Every room has its own bathroom and TV. Plane Tree Lodge 172 Victoria Street. Phone 02 9356 4551. All rooms have TV and fridge. Eastend Lodge 21 kellet Street, Kings Cross. Phone 02 9380 2590. Great Aussie Backpackers 174 Victoria Street, Kings Cross. Phone 02 9356 4551 or freecall 1800 006 613. Lido Bakpak Apartments 2 Roslyn Street, Kings Cross. Phone 02 9358 4844. Sydney Central Backpackers 16 Orwell Street, Kings Cross. Phone 02 9358 6600. Springfield Lodge 9 Springfield Avenue, Kings Cross. Phone 02 9358 3222. The Globe Backpackers 40 Darlinghurst Road, Kings Cross. Phone 02 9326 9675. The Palms Backpackers 23 Hughes Street, Kings Cross. Phone 02 9357 1199. The Wattle Hotel 64 Darlinghurst Road, Kings Cross. Phone 02 9358 1256. Highfield Private Hotel 166 Victoria Street, Potts Point. Phone 02 9326 9539. Rucksack Rest is quiet. 9 McDonald Street, Potts Point. Phone 02 9358 2348..
Challis Lodge 21-23 Challis Avenue, Potts Point. Phone 02 9358 5422. Macleay Lodge 71 Macleay Street, Potts Point. Phone 02 9368 0660. Nomads Downtown City Backpackers has lots of activities. 611 George Street (Corner of Goulburn Street) just south of the cinema district. Phone 02 9211 8801 or 1800 737 378. Nomads City Central Backpackers 752 George Street, Sydney. 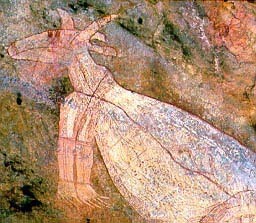 Phone 1800 737 378. Y on the PArk Hotel from the YMCA and YWCA accepts guys and girls. 5-11 Wentworth Avenue (corner of Liverpool Street opposite Hyde Park), Sydney. Phone 02 9264 2451. Planet Backpacker 198 Elizabeth Street, Sydney. Phone 1800 774545 or 02 9211 4200. Fax 02 9211 7530. Price unknown. New kitchen and bathrooms, full bar, restaurant, café, internet, TV room, internet. Central Private Hotel 358 Elizabeth Street, Sydney. Phone 02 9212 1068. Hyde Park Backpackers 90 Wentworth Avenue, Sydney. Phone 02 9282 9266. Sydney Backpackers 7 Wilmot Street, Sydney. Phone 02 9267 7772 or freecall 1800 887 766. Sydney Central Private Hotel 75 Wentworth Avenue, Sydney. Phone 02 9212 1005. See also Big Hostel listed under Surry Hills below. Woolloomooloo is mostly residential a suburb one kilometre east of the city, just across Hyde Park from the city and very close to Kings Cross. Forbes Terrace is clean, quiet and has a courtyard. 153 Forbes Street, Woolloomooloo. Phone 02 9358 4327. Australian Backpackers 132 Bourke Street, woolloomooloo. Phone 02 9331 0822. Glebe is 3 likometres west of the city centre and is serviced by a light rail from Central Station (which is not really that central) that runs through the newly developed Darling Harbour entertainment precinct on the way. The Haven Inn 196 Glebe Point Road, Glebe. Phone 02 9660 6655. 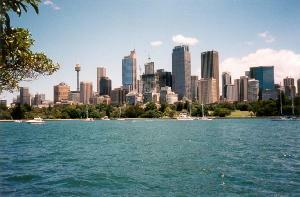 Darlinghurst is a lively inner city suburb 2 kilometres south-east of the city centre. The suburb can be grungy and a bit seedy in places. Boomerang Backpackers 141 William Street, Darlinghurst. Phone 02 8354 0488. Sydney Star Accommodation 273 Darlinghurst Road, Darlinghurst. The Wattle Hotel 108 Oxford Street, Darlinghurst. Phone 02 9332 4118. Paddington is a suburb 3 kilometres south-east of the city centre. The main street, Oxford Street, is lined with glitzy clothes shops and the side streets are full of terraces occupied mostly young professional. It is a good area. Sullivans Hotel Sydney 21 Oxford Street, Paddington. Phone 02 9361 0211. Captain Cook Hotel 162 Flinders Street, Paddington. Phone 02 9331 8289. Surry Hills is 2 kilometres south of the city centre and situated behind Central Station, which is the main long distance railway station. Redfern is the adjacent suburb a little further from the city centre. Redfern has a notorous reputation as being Australia's worst suburb and is well known for race riots between police and indigenous aborigines. To give you an idea, the pedestrain crossing outside Redfern railway station was removed so car drivers did not have to slow down at night and risk being mugged and car-jacked. Walking in bad parts of the area is not recomended. Big Hostel is on the edge of Surry Hills and is virtually in the city. 212 Elizabeth Street, Surry Hills. Phone 02 9281 6030 freecall 1800 212 244. Noahs City Central is not much further away from the city at 238 Elizabeth Street, Surry Hills. Phone 02 9211 91111. Kangaroo Bakpak 665 South Dowling Street (near the corner of Cleveland Street), Surry Hills. Phone 02 9310 4116. Sinclairs of Surry Hills Budget Accommodation 510 Cleveland Street, Surry Hills. Phone 02 8399 0211. Gracelands Budget Accommodation 461 Cleveland Street, Redfern. Phone 02 9699 1399. Noah Lodge 179 Cleveland Street (corner Regent Street), Redfern. Phone 02 8303 1303. Kirribilli is a small suburb full of aprtments on the north shore just over the Sydney Harbour Bridge and has stunning views back to the city on the other side of the bridge. It is still a two kilometre walk over the bridge to the city centre. Taking a train to Milsons Point railway station would be a quicker, though less exhilarating way to get to Kirribilli. Glenferrie Lodge 12 Carabella Street, Kirribilli. Phone 02 9955 1685 or freecall 1800 121 011. Newtown is an altenative grungy suburb 4 kiometres south-west of Sydney behind Sydney University. The main street, King Street, has many ethnic food outlets. Abbey on King Backpackers 379 King Street, Newtown. Phone 02 9519 2099 or freecall 1800 219 999. Balmain is a good residential suburb 6 kilometres west of the city centre. Balmain Lodge 415 Darling Street, Balmain. Phone 02 9810 3700. Dulwich Hill is a suburb 7 kilometres south-west of the city centre. If planning to stay in Sydney for a few months cheap flats are readily available in Bondi, 7 kilometres east of the city centre. Stay at Bondi to meet people with the same intention and split the cost of renting. Renting a place with ocean views is a lot more expensive. Bondi Beach Guest House. 11 Consett Avenue, Bondi Beach. Phone 02 9300 9310. $20. Biltmore on Bondi 110 Campbell Parade, Bondi Beach. Phone 02 9130 4660 or freecall 1800 304 660. Bondi Sands 252 Campbell Parade, Bondi Beach. Phone 02 9365 3703. Sinclairs of Bondi Budget Accommodation is located quite some distance from Bondi Beach, about 1.5 kilometres. 11 Bennett Street, Bondi. Phone 02 8399 2518. Noah's Bondi Beach 2 Campbell Parade. Phone 02 9365 7100 or freecall 1800 226 662. Dorm $24 to$25, twin or double room $55. Coogee beach is 8 kilometres east of Sydney city centre. Indy's 302 Arden Street. Phone 02 9315 7644. Includes breakfast. Coogee Beach Backpackers is clean and uphill from the beach with good ocean views from the patio. 94-96 Beach Street, Coogee. Phone 02 9665 7735. spacious dorms. Also has double and twin rooms. Kitchen. Coogee Bunkhouse 15 Waltham Street. Phone 02 9665 9254. Colvelly beach is between Bondi Beach and Coogee Beach. Clarks at Clovelly Budget Accommodation 272 Clovelly Road, Clovelly. Phone 02 9665 1824 or freecall 1800 551 415. Manly is a quieter pleasant beachside suburb on the north shore 15 kilometres north-east of the city centre but still only a half hour ferry to Sydney's Circular Quay. Wharf Backpackers 48 East Esplanade opposite the ferry terminal. Phone 02 9977 2800. Collaroy is a beachside suburb further north and further from the city than Manly. To get to Cronulla take an Illawarra line train from Sydney city to Cronulla station, which is the last station. The train leaves the Sydney's city centre train stations every 15 minutes during peak times and 30 minutes off peak. The travel time is approximately 40 minutes from Sydney city. There is a direct service from Kings Cross, Town Hall and Central stations. From Sydney airport take the train to Wolli Creek station and change to the Illawarra line there. 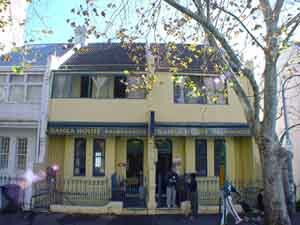 Click here for the Sydney Backpackers Hostel Directory (it contains just a list of the above hostels). At Darling Harbour, Cocklebay Wharf (on the city side of the harbour) and the Harbourside Centre have a number of modern restaurants and food courts. Kings Cross itself mainly has places for a quick bite only. The take-away kebab places can be poor. The red light district on Darlinghurst Road in Kings Cross is not a good place for a relaxing evening meal. However Darlinghurst Road in Darlinghurst (south of Kings Cross) and Oxford Street in Paddington. have pleasant restaurants and a mixture of cuisines. Crown Street in Surrey Hills (off Oxford Street) has more restaurants spread out along it. Newtown is a cheap alternative grungy suburb and there are a number of restaurants on King Streeet there. The popular beachside suburbs of Bondi and Manly also have restaurants with Bondi having a couple of yuppie café/restaurants overlooking the beach. Check out a weekly entertainment guide for up to the minute information. Different nights of the week at the same nightclub can be very different. Often you will see the name of the night advertised rather than the name of the nightclub. Where and what night is popular changes quickly, especially with smaller clubs. Home is a massive nightclub at Cocklebay Wharf which is a complex located on the east side (or city side) of Darling Harbour. Entry from ground level at the southern end. Kinselas is a huge funk nightclub. 383 Bourke Street, Taylor Square, Darlinghurst. EP1 at 1 Earls Place, Kings Cross (next to Kings Cross Station, Victoria Street exit), is very popular with backpackers, especially on Saturday night. The name of the night is "Carpark". Rhino Bar is a popular Kings Cross backpackers venue. 24 Bayswater Road. Phone 02 9357 7700. Try the touristy Rocks area for some smaller tourist orientated pubs with a thirty something crowd. Scubar is underneath the city YHA at the corner of George Street and Rawson Place (near Central Station). 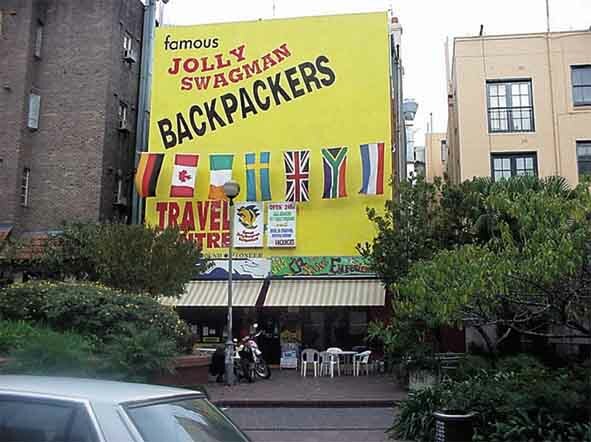 It promotes itself heavily to backpackers. Mainstream cinemas are located on George St between Bathurst and Liverpool Streets. Cost $14 approximately. Kinsford-Smith airport has international and domestic connections. The airport is 10km south of the city. For timetabling and pricing either phone them or refer to their websites. Virgin Blue, which is associated with Virgin Atlantic, advertises itself as a discount airline, though better prices can sometimes be obtained on both airlines by booking through their websites. The airport express bus runs to and from Central Station every 10 minutes. $7 for the 15 minute journey. Bus 300 runs via Circular Quay to the airport. Bus 350 runs via Kings Cross to the airport. Kingford Smith Transport (phone 9667 0663) for $7 and The Sydney Airporter (phone 96673800) will pick you up or drop you at hotels and hostels in the city, Kings Cross and Darling Harbour. Major car rental agencies are at the airport. Central Station in the city has rail connections interstate and to country New South Wales. Buses are cheaper, and on long trips and faster, though less comfortable. They leave from outside Central Station. Remember distances in Australia are vast. For example it takes 12 hours and an $120 bus fare to get to Melbourne, the nearest big city 900 km away. Kangaroo Coach 5 day tour one-way to Byron Bay. Phone 1800 666355. The major car rental companies and a number of smaller companies are on William Street. The major companies are also at the airport. Prices for unlimited kilometres and fully insuranced are $60-$100 a day depending on the size of the car. Cheap rent-a-bomb operators are also on William Street. Petrol is around $1.00 a litre in the cities going up to $1.30 a litre in the outback. A car is an excellent way to experience the Australian country side. You can stop for scenic views and detour into National Parks where ever you please. If you plan on touring long distances in Australia over an extended period of time, buying a cheap second hand car with a couple of friends can work out more economical than paying bus fares. It is wise to always have a car mechanically checked before buying, otherwise you might find yourself with a lemon. The motoring body in each state will check cars for a fee under $100. In New South Wales the motoring body is the NRMA. Attempting to use your own car in inner Sydney would be a nightmare. The traffic is horrendous, many streets are one-way, often right-hand turns are prohibited and parking is almost impossible to find even late at night. Sydney has a network of trains and buses. 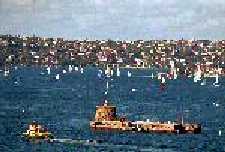 Ferries operate between Circular Quay in the city and harbourside suburbs. A tourist monorail runs from the city to Darling Harbour. A tourist tram runs from Central Station to Star City Casino. Legion 131451, Premier 131017, RSL 131581, Taxis Combined 9332 8888. Blue Mountains A major attraction. See separate page. Hunter Valley Wineries north of the city inland from Newcastle. Sandstone cliffs, bushland and great views of Broken Bay. Entry is $8 per car. Accommodation available at YHA Pittwater which has a pretty setting and lots of wildlife. Phone 02 9999 2196. Dorm $19, twin $22 per person. Canberra the nations purpose built capital city with extravegant modern governmental buildings in five hours drive south-west of Sydney.. Snowy Mountains winter ski fields are three hours further south beyond Canberra. Along the coastal Pacific Highway passing through Newcastle, Myall Lakes, Forster, Port Macquarie, Nambucca Heads, Coffs Harbour, Byron Bay, and the Gold Coast surfing and party mecca to Brisbane the Queensland state capital, then further north to the Great Barrier Reef and Cairns. Directly on the inland Hume Highway detouring into Canberra on the way and possibly the Snowy Mountains ski fields. Via Canberra and Mildura on the Murray River. Copyright (c) 2005 Graham Warren. Backpackers Guide to Australia (TM) is a trademark.